Effective Governance, Risk Management and Compliance (GRC) allows organizations to manage business needs, risks and regulatory requirements. ABACUS helps companies comply with the mandates and international standards relevant to their operations. GDPR and other data protection legislation. ISO, Sarbanes-Oxley (SOX), Basel I / II / III and Six Sigma. 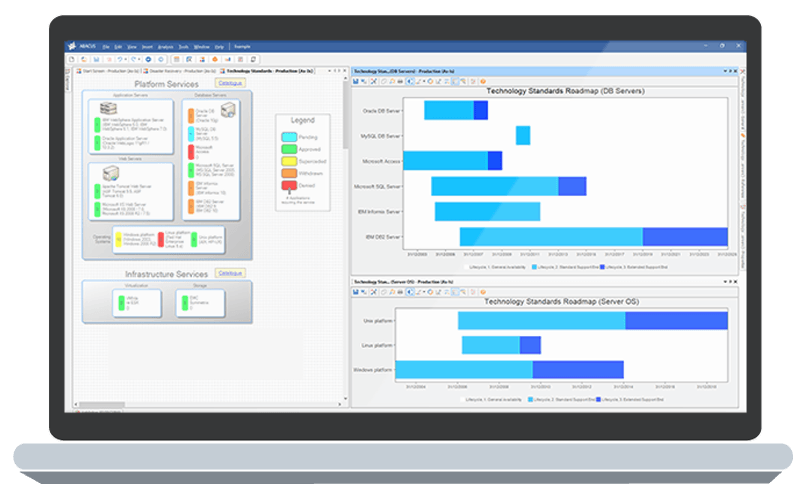 Scenario modeling in the tool can be used to predict KPIs for financial, technical and business risks. This analysis is enhanced by ABACUS‘ reliability algorithms (using Monte-Carlo techniques). Continuous risk management techniques, including NASA’s CRM and Balanced Scorecard. By modeling risks using ABACUS‘ Monte-Carlo analytics, practitioners can provide a detailed, quantitative analysis of how IT risks affect the business. To identify and mitigate compliance and risk issues, users can run detailed compliance, DR/BCP and enterprise security modeling using ABACUS‘ powerful simulations and algorithms. Charts, heatmaps, matrices, dashboards and other reports can be used to understand compliance violations, relative costs of compliance and the financial consequences of non-compliance.